Today is a travel day and I am in Toronto waiting for my connecting flight to Edmonton and then onto Grand Prairie. I was able to take some pics from the plane of Niagara Falls and the Space Needle Kinda cool except the Falls look small from up here. Definitely a place to go for a road trip in a year or so when Z-girl is a little older and 6 or so hours in the car is doable. Tonight I will meet Phillip and Eva and see what I will be calling home for the next week I am excited and also a little sad to be without the family for the week but I am hopeful that the experience will be a worthwhile and memorable one. 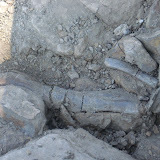 That’s it for now, tomorrow we dig for the bones of creatures that roamed the earth millions of years ago. I wonder why so many people put so much time in effort into discovering and researching dinosaurs. Is it to discover why and how they became extinct and somehow better understand our current environment or is it because Dinosaurs have always had some magical quality to them and as children we are drawn to discovering as much as we can about them. Their size alone makes them awesome yet these creatures have been the most successful living things on earth and then they were gone in a very short time. Dinosaurs roamed the Earth for 165 million years, by comparison we have only existed for about 200,000 Years.